Since I've been posting so much about sock monkeys, I thought I'd gather up some internet resources on the little critters and share them with you today. 1. Start here for an overview of sock monkeys. 2. This site has some discussion of the history of sock monkeys, but is particularly interesting because it talks about the differences between U.S. and Canadian sock monkeys. 3. Go here and you can learn how to make a sock monkey. 4. If you haven't read Tony Millionaire's Sock Monkey comics, you're missing out. 5. For a book on the art, history and business of the American sock monkey, check out Everything's Coming Up Sock Monkeys! 6. Do NOT go on You Tube to look for sock monkey skits. They're all terrible and a huge waste of time. 7. If you want to buy Red Heel socks to make your own sock monkey, check here or, if you're in the Western New York area, I know you can get them at Vidler's Five and Dime. Enjoyed your posting and thank you for listing my book, Everything's Coming Up Sock Monkeys. I am honored. It is a work in progress –sort of an art exhibit cataloging it all- so volume 2 of course is in the works since I only scratched the surface in the first book. Loved learning about Vidler’s 5 & 10. There is always something more to learn about sock monkeys because human creativity will never cease –creativity only knows expansion. I am very interested in differences between U.S. and Canadian sock monkeys. Really enjoyed seeing Craft Buff and all that you do. Thanks so much for commenting; I look forward to reading Volume 2! Vidler's is a great place to visit if you're ever in the area. I love the heart that wants to give to another heart in need no matter what the need is. It is above politics - religious beliefs - race - creed and color. Sock monkeys transcend all bias and go straight to the heart of the matter - that is why I love them - they are good for all. Bonnie- And they surely bring a smile, no matter where they're sent... My cynicism about current U.S. politics/convergence of church and state is strong but was misdirected in this instance. 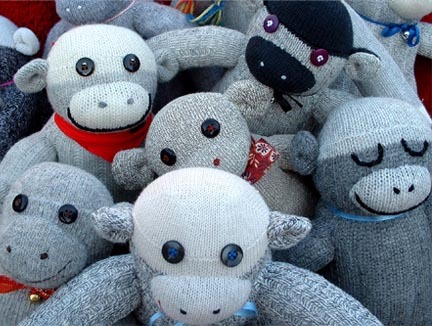 Sock monkeys for all and kudos to those who make them! Rachel, I am not certain as to what all has transpired. I was emailed that I should read your comments and discussion our our ministry. I do appreciate that you removed your comment. That is what is so wonderful about this country, that we have freedom to voice our opinions freely. Everyone has a right to what they feel. I do wish to defend one aspect if I may. This ministry started as an outrach to homeless people by showing children in our sunday school class the importance of serving and helping others. I was diagnosed with matastic breast cancer and felt that I couldn't serve in the same capacity that I once did. I started making sock monkeys because I knew that warm fuzzy feeling gave me comfort and thus encouraged the kids in my class at that time to help me make them (I was confined to a bed). It spread from there and went crazy! I am true to myself and not ashamed as to where the ministry started or where it is headed. It is what it is. It gave me a new outlook on life and caused me to strive forward in my recovery. Unfortunately, it has spread to the bone, so I am just here trying to make a difference in the world one monkey at a time. I started making cancer awarness monkeys and started to send them to cancer patients to bring a smile on their face, then it went to orphanages from there all over the world! Then I felt that we needed to support our troops (not as a political statement, but to encourage them and help them to know that we here in the USA are still remembering them). I had a friend who was in vietnam, and he was spit on when he returned. As if it was his fault he was there! I am not making a political statement, I am merely sharing a bit of uplift and encouragement to those who receive the monkey because politics do get in the way too often. We send these monkeys to all faiths, races, and beliefs. We are not trying to mix anything, simply sharing a random act of kindness to those around us. We live in an unpeaceful world. All we are trying to do, is share a little joy in the middle of it. 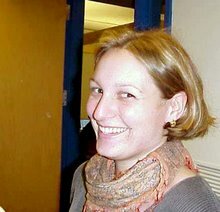 Beth-Founder and President, Sock Monkey Ministries, Inc. Thanks to your mention of Vidler's Five and Dime July 27...my book is now in their store. Check it out.